Stylish, cozy B&B with 6 rooms (all with bathroom), restaurant and Wi-fi Internet. 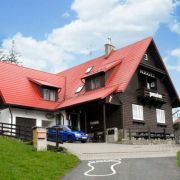 B&B is easily accessible, surrounded … More » by mountains and offers a base for hiking, biking, skiing and many other activities in Beskydy Mountains. It is located just 200m from the chair lift going to up Pustevny.